Imagine a typical e-commerce online sale of a product — say a $500 camera — sold by a seller from New York to a buyer from California. Assume the buyer receives a camera from the seller, but it turns out to be a much lower quality camera than the camera originally ordered. The buyer, of course, would want to receive the camera ordered, or at least rescind the sale and get her money back. Suppose follow-up emails and threatening telephone calls cannot resolve this dispute, and the seller already has the buyer’s money. What should the buyer do — sue the seller? If so, in what court should she sue, and where; would it be in small claims court in California, or in New York? And what law should apply: that of California or that of New York? The problem is that it is difficult to determine exactly “where” the dispute arose when it essentially occurred in online, in what we affectionately used to call “cyberspace.” Perhaps most importantly, would a formal lawsuit in any physical court even be worth it in terms of time and money, where at least one party might be required to fly to either California or to New York? Indeed, a roundtrip ticket alone might be worth the entire amount in dispute. Do these practical cost, legal uncertainty, and location concerns make the filing of a formal lawsuit essentially impossible such that justice is effectively denied because e-commerce has been reduced to the equivalent of the “Wild, Wild West,” governed only by a caveat emptor/buyer beware reality? Not according to Professor Fred Galves and Sacramento attorney David Allen, who were granted a patent in online dispute resolution for e-commerce disputes on Jan. 29, 2013. Their United States Patent 8364603, which is a prototype ODR legal forum, was was a long time coming considering it was initially filed with the U.S. Patent Office in April 2003. Allen is the managing attorney in the law firm he founded in 1980, David Allen & Associates. Allen and Galves have worked on online dispute resolution ventures together for more than a decade. 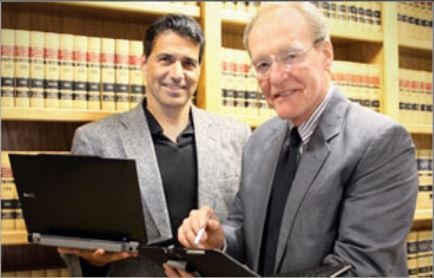 They co-own two businesses poised to engage in online dispute resolution, DotComJustice and Traffic Court Online, which is for settling traffic tickets online and/or preparing clients for trial if settlement is unsuccessful. Galves and Allen believe that there needs to be a quantum shift away from geographical location-based lawsuits designed to adjudicate transactions that take place in-person or are sufficiently connected to one state or country in the world. Instead, online justice requires that we transcend such an antiquated paradigm. As a result, they argue that the answer lies in using the very same medium that makes every e-commerce transaction possible in the first place — the internet. Personal jurisdiction disputes are immediately solved because neither litigant has to physically attend an in-person proceeding as the entire dispute can be resolved in online — “where” the disputed transaction occurred in the first place. The resulting efficiencies make it possible to adjudicate low amount in controversy disputes entirely on the merits instead of subjecting such disputes to high-cost, in-person, judicial proceedings and the vagaries of internet jurisdiction, or simply not adjudicating such disputes at all and leaving the buyer and seller to an unsatisfactory online caveat emptor regime. Despite all of the growth, convenience, and economic advantage that e-commerce offers, increased Internet sales activity also brings with it an increase in Internet legal disputes, as legal disputes arising out of typical business transactions have not disappeared merely because those transactions are made online. These inevitable e-commerce disputes must be resolved efficiently, fairly, and securely so that online buyers and sellers can place full confidence in e-commerce markets. Galves is also heavily involved in Online Dispute Resolution (“ODR”) for both private businesses and public agencies and courts. He is on the Advisory Board of Modria, Inc., the Largest Online Dispute Company in the world. Online Dispute Resolution is poised to engage in settling disputes for Traffic Court, Small Claims Court, and Family Law Court. State agencies and private businesses will also benefit with “ODR” in place.